When I was in college, I did four of my five semesters toward a minor in creative writing with Michael McFee. As part of my recent renewed interest in poetry, I’ve been rereading his poetry collections, and over Christmas, I was given a copy of his recent collection of essays, entitled The Napkin Manuscripts. I read the book while on a business trip to California, and it reminded me of how dear my time studying poems in Chapel Hill was to me. It helped to kindle in me a renewed interest in writing, probably because many of the anecdotes were familiar to me already, because I felt transported back to that period of creativity. One of the essays in the book inspired me to organize what turned out to be a two-person poetry reading I previously announced. It’s a good book that came at a good time for me. The Napkin Manuscripts contains essays about being a southerner, and a southern poet, and having a sense of home; essays about belles lettres and the life poetic; essays about other poets; and the transcript of a conversation between McFee and fellow poet and friend Michael Chitwood held at a conference honoring McFee and his work. It really is a good read. Michael McFee will be at Carpe Librum on Saturday, March 17 at 2:00 pm. A well known author and poet, he is a professor of English at UNC-Chapel Hill and director of their Creative Writing program. 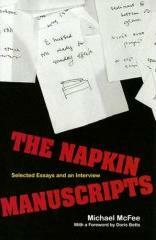 The book he will be reading from and signing is The Napkin Manuscripts: Selected Essays and an Interview. Doris Betts did the Foreword. He has seven or eight poetry collections to his credit and I am not sure how many more books. Don’t drink green beer, come to Carpe Librum on St. Patrick’s Day. Provided my impending son doesn’t gum up the works by making a late appearance, I’ll be there for sure. McFee’s a great reader and a very personable guy, and it’s sure to be an engaging event.